According to a report from the Korean ChosunBiz LG had plans to adopt a flexible edge-type display in its next flagship phone, the G6. But LG Display could not produce enough such displays as it does not have enough capacity - and the Korean company will adopt a flat LCD display. 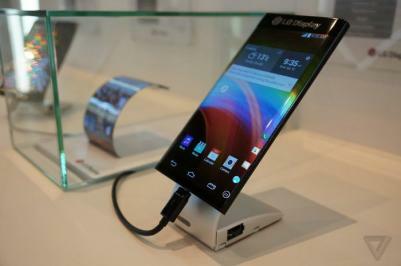 LG Display has been developing flexible OLED display technologies for a long time, and back in January 2015 the company already demonstrated the prototype you see above - a 6" plastic OLED display that curves on both edges. LG currently produces plastic-based OLEDs in its Gen-4.5 fab, with a monthly capacity of 14,000 substrates (more than double its capacity in the beginning of 2014). LG Display's flexible AMOLEDs were used in LG's mobile phones (the G Flex 2) and are currently used in wearable devices (such as the Watch Urbane) and in Apple's Watch and Watch Series 2. So LG's flexible OLED capacity is quite limited at this stage.